Facebook and Mark Zuckerberg have established near monopoly control over the language that we use to talk about social networks. Think about the words that we use to describe social network sites — terms such as “like”, “share”, “connect”, “transparent”, “more open”, etc. I’m not saying that Facebook were the first company to use these terms and they certainly didn’t invent them. But I do believe that Facebook have been the most effective and the most consistent at using those words to frame the conversation about social network policies and features in moral terms. The moral framework they’re creating around their social network site is really key to focus on. Facebook are saying: It’s *good* to be liked, right? It’s *good* to connect to more people, right? You’re a *better* person if you’re willing to share more transparently, right? And, conversely, if you’re *not* willing to share a thought or action openly, then what are you hiding; are you doing something that you *shouldn’t* be doing? At Facebook we have a deeply held purpose […] Our mission: “Give people the power to share and make the world more open and connected.” In the world we’re building where the world is more transparent, it becomes good for people to be good to each other. That’s really important as we try to solve some of the world’s problems. George Lakoff, professor of linguistics and cognitive science tells us that, in any debate, if one side manages to dominate the moral framing of the issues, then they’ve already won the debate before it even begins. Facebook appear to have learned Lakoff’s lessons well. By framing the debate about social network policies and features in their own moral terms, Facebook could be walking away with victorious dominance over the social internet without firing a shot! Every other social internet company has been forced to define themselves using Facebook’s terminology of “sharing”, “openness” and “social graphs” (i.e., attempting to beat Facebook at their own game) or to contrast themselves against Facebook’s feature functionality (i.e., attempting to convince the world that sharing, openness, and transparency are bad things). It’s a lose-lose proposition either way and that makes it really hard for other companies to market and differentiate themselves using the language and concepts that Facebook own. What are your thoughts on how the social network industry should move forward from here? I’ll jot down some thoughts in my next blog post. Would love to hear your thoughts in the meantime. I’m a co-founder of a startup and I’ve noticed that our advisors are beginning to form “teams” around two opposing schools of thought for gaining early user adoption. These two philosophies are mostly mutually exclusive so I think entrepreneurs need to make a choice about which camp they fall into… Which are you? Mark Davis of DFJ Gotham Ventures posted this nice summary list of six types of risk that venture capitalists typically examine when evaluating a potential investment. I had the pleasure of hearing Avinash Kaushik, Google’s analytics evangelist, speak when he came to our CS377W class at Stanford this quarter (the “Stanford Facebook class“). He’s an amazing speaker, really breathing life and purpose into the too-often dry topic of web analytics. 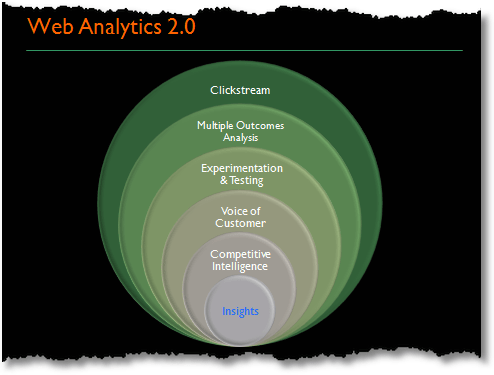 He’s promoting a new way of looking at web analytics, what he calls “Web Analytics 2.0”. Avinash’es central message is that analytics cannot stand alone as a decision driver in organizations; rather analytics need to be considered in the context of additional data (from customers, competitors, and other internal sources) in order to drive rational decisions.